Warning: SPOILERS for Guardians of the Galaxy #146 ahead. Over the course of their storied career, the Guardians of the Galaxy have been many things to many people: scoundrels, rogues, scavengers, and even reluctant heroes. But they've never "officially" signed up, lock, stock, and two smoking Element Guns, to protect the cosmos – well, at least not without a good scam in mind. However, all things can change, as they do in the freshly legacy-numbered Guardians of The Galaxy #146. After a trip back to Earth, where they picked up a new team member in Ant-Man (although Deadpool gave it his best shot), the celestial squad finds themselves with a serious quest: dig up the Infinity Stones before you-know-who (Thanos) does. Along the way, they teamed up with some old foes/friends: the recently reformed Nova Corps. In Guardians #10, just before the numbering change, the crew were caught between two bickering Elder siblings, the Collector and the Grandmaster. Both recognized that the universe had undergone subtle but mind-numbing alterations and wanted to test one another to make sure they hadn't been changed themselves. After passing each other's tests, they expressed their concern over two missing Elders, the Contemplator and the Gardener – the latter who is responsible for stunting Groot’s growth. More startling, the Infinity Stones are nowhere to be found, something weighing heavily on Gamora since a piece of her is trapped inside the Soul Stone. While Star-Lord (Peter Quill) suspects the great purple thumb of Thanos, the truth could be a little more treacherous. Loki’s been toying with the Gardener’s emotions. In the meanwhile, the Guardians have an infinitely massive task on their hands. And what better way to canvas the cosmos for ultra-powerful missing stones than by expanding their breadth through a Nova Corps collaboration? The Corps themselves could use the help, too. They're a shadow of their former glory after they, along with Nova Prime Richard Rider, sacrificed themselves to stop Thanos and the Cancerverse incursion in “The Thanos Imperative” (2010). Since then, Sam Alexander kept the faith, taking up his father’s old Supernova helmet. The Corps has slowly rebuilt; Their resources are coming together, but their volunteers are young and inexperienced. Morale is waning and, on top of that, somebody (or bodies) has been swiping money and gear, sabotaging the renovated space defenders from within. Used to being the misfits of the cosmos, the Guardians now take on positions of authority thanks to their many interstellar exploits. As they help former S.H.I.E.L.D. agent and now Nova Commander Scott Adsit reform their ranks, they also make some startling discoveries: first off, Peter realizes Rich Rider is alive and back in action, something which Gamora never mentioned – perhaps as payback for not telling her Thanos was on Earth during Civil War II. Secondly, on a rescue mission, Gamora and Ant-Man also discover that one of the Avengers’ greatest foes, Ultron, has made major waves beyond the Earth, infecting alien species with his Ultron parasite and converting them into a hive-minded cyborg army. Life in deep space is getting extra-complicated. 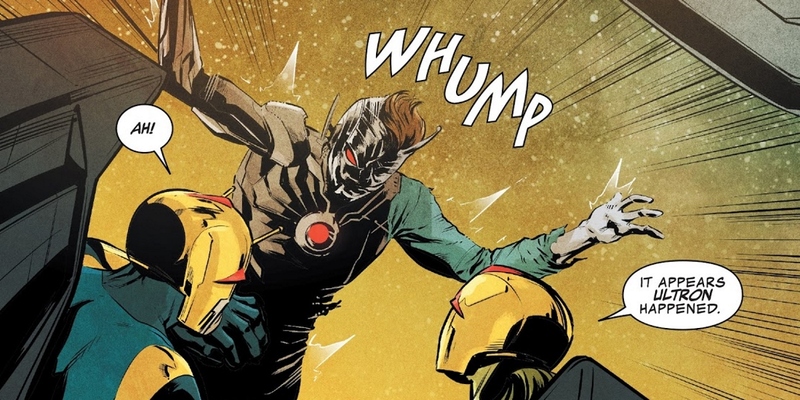 So, it’s a good thing the Nova Corps is back with a crew that can think their way out of just about any intergalactic snafu. Watching the Guardians get themselves into and out of trouble has always been a blast. At the same time, the squad’s best moments arise when they become part of something greater. In particular, Dan Abnett and Andy Lanning (or D‘nA) knew how to wring out their best storylines, including the “Annihilation: Conquest” and “The Thanos Imperative,” which showcased the team, the Novas, and the Marvel’s other cosmic heroes saving the universe. Currently, the team is charged with a dangerous mystery with galactic ramifications. Of course, as Corps members, they’ll have to play by the rules… or at least find the best ways to bend them. In an ever-changing universe, though, the rules and ethics aren’t always so black and white – which is why the Guardians are the perfect Nova recruits. Guardians of the Galaxy #146 is currently available.